Description: It is a fast-growing columnar cactus , branching at the base that can grow 2–5 (-6) m tall with stems of up to 15–20 cm in diameter. Spines: Honey-coloured to brown, located on the nodes in groups of up to 4. They can grow up to 6–7 8-(-10) cm in length and in fully grown plants are spaced evenly on the ribs, 2.5 to 3 cm apart. 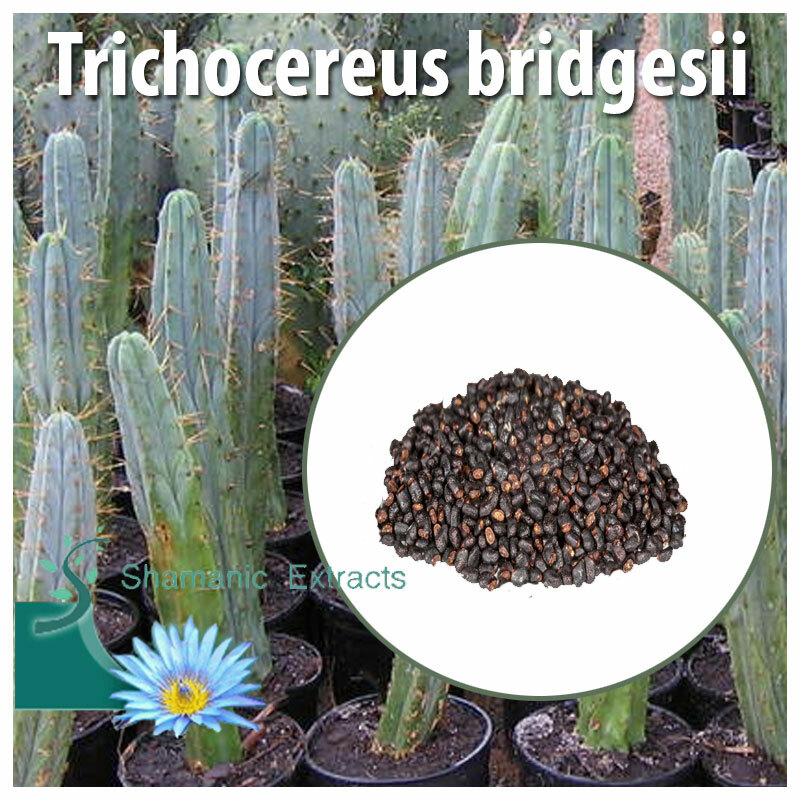 Grafting stock: Along with T. pachanoi (that is commonly suggested as a universal grafting stock) T. bridgesii work well and have a good success rate for lasting a long time. Scions grafted on Trichocereus might initially take slightly longer to begin their growth burst (when compared to other grafting stocks), but usually have a very good life span of steady fast growth. Defense: Trichocereus bridgesii in Bolivia is grown both as a hedge plant and placed on top of walls as protection for gardens. In fact the spines are very efficient at deterring theft or animals. Psychoactive effect: The Trichocereus bridgesii has a long shamanic tradition of use throughout its homeland in the high Bolivian deserts where it is sometimes called achuma or wachuma. The mescaline content is very close to san pedro (about 2% in dry samples), but some individual Trichocereus bridgesii plants have a mescaline content that exceeds that of san pedro (Trichocereus pachanoi). Trichocereus bridgesii is often cultivated indoors for it's powerful and protective spirit. Share your experience about Trichocereus bridgesii with other customers. Submit your tips or thought on this product, be detailed and specific.